THERE has been so much controversy surrounding Nigerian prophet TB Joshua, a man renowned world over yet most vilified over for his miracle healing services and predictions. The controversies have been raging ever since TB Joshua's ministry stormed into the public domain bringing into question the legitimacy of his works. In talking about legitimacy, I am referring to the standards as set forth in the scriptures, which would help us, identify a genuine prophet. Who then is TB Joshua? TB Joshua whose full names are Temitope Balogun Joshua was born on June 12, 1963, in a village called Arigidi, in Ikare Akoko, Ondo State of Nigeria. He is married to Evelyn and has four children. 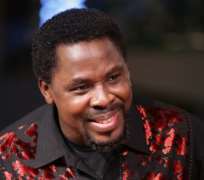 TB Joshua, the founder and pastor of the Synagogue Church of All Nations is said to have sparked controversy starting with his mysterious birth. He allegedly remained in his mother's womb for 15 months before he was born. He attended primary school at St Steven Anglican school from 1971-1977, but failed to complete one year of secondary school. But as he was growing up, he was known as a “small pastor” because of his love for the Bible and ability to predict things to come in his community. He further gained reputation for spiritual prowess after confronting and disarming a madman who was wielding a machete in the school premises. While in school he was the leader of a scripture union. When Joshua started the Synagogue Church of All Nations in 1987, he just had a handful of members but since then the church has grown far beyond the shores of Nigeria. More than 15,000 members attend the weekly Sunday service. Numerous videos have been produced documenting the healing of incurable sickness, cancer, paralysis, AIDS, showing people's conditions before, during and after prayer. Medical doctors have examined the patients before and after and have testified to a supernatural activity beyond medical science. TB Joshua does not even claim to be healer but says, “I am just God's servant”. On Michael Jackson's death, the prophet was seen by a global audience via his television network saying, “I see a star being rushed to the hospital but he wont come back home, the whole world will be shocked. He is a great star in his world”. To add mystery to this prediction, TB Joshua sent a message through the pop star's associates to let Michael come for prayer and deliverance in Nigeria. The associates thought the message a bit misplaced, because Michael was declared medically fit by his doctors and he was billed for a world concert tour beginning July 13. But alas! That was not to be, he died on June 25 before seeing Prophet TB Joshua. Since the beaming of Emmanuel TV on free channel stations in most parts of Zambia, we have witnessed an unprecedented following of TB Joshua's programmes. As a result, emotive debates have emerged from the pulpits to the pews, between clergy and lay people. The man has arrived on the scene, should we dismiss him or his utterances as the ravings of a madman? How do we know for sure that we have a prophet among us? Signs and wonders are daily phenomena in his ministry, just the way it was as recorded in the book of Mark16:20: “then the disciples went and preached everywhere, and the Lord worked with them and confirmed his word by signs that accompanied it”. It is amazing that some of the most fearsome critics of TB Joshua have no signs and wonders in their ministry and they want to take it upon themselves to persecute this great man of God. Is it not surprising, that even Jesus in his earthly ministry was accused of casting evil spirits by the powers of Beelzebub? Can these same critics who call themselves bishops, reverends, pastors and all manner of description show us one thing they are doing in their ministries that can fit into God's compassion for humanity? TB Joshua's humanitarian effort touches the needs of widows. The physically challenged and orphans have benefited in his educational support projects. Recently the federal President of Nigeria, Musa Yar'Adua, a Muslim himself awarded him with “Officer of the Order of the Federal Republic” in recognition of his humanitarian efforts. Most people who persecute Joshua, particularly clergymen are moved by jealous and envy as he seems to expose fake ministries by his tremendous charities without begging for money. Anyone who is a true seeker of truth can know in the light of scriptures that for sure there is a prophet among us.